During my recent sojourn in Scotland my chalet buddies humoured me with a final day of driving around, following brown tourist signs and making an occasional stop at a distillery. We popped in to Cardhu, where we missed a tour, and ended the day at Glenfiddich (which I may write about at some time in the future). In between we briefly stopped by The Macallan, a whisky that I hadn’t tried for years but that seems to be rather well respected. Unfortunately we couldn’t grab a tour as places needed to be prebooked by phone (as the lovely ladies who ran the distillery shop repeatedly informed us – they did not enamour themselves to me), but we had a chance to have a nose around the shop and try a quick complimentary dram of their regular 10 year old expression – a whisky that I liked a lot more than I thought I would. Rather than the boring Speyside that I expected I got a lightly woody whisky that was intriguing and definitely worth a second look. Rather than grabbing the same again as a takeaway I picked up miniatures of their two 12 year olds – the slightly older version of their regular whisky and the 12 year old Fine Oak. 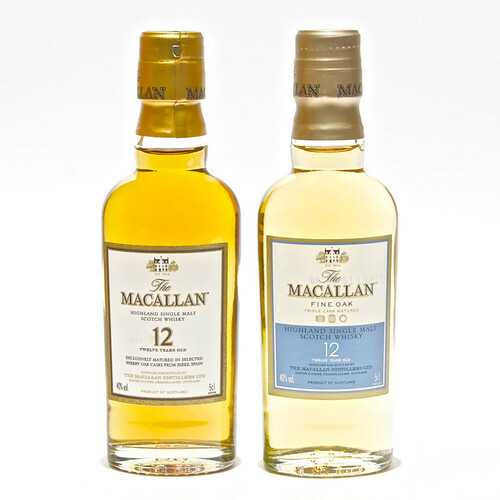 Macallan is known for exclusively using ex-sherry casks in maturing their whisky, but the Fine Oak editions add in some ex-bourbon maturation into the mix, ending up with three barrels used in making the whisky – spanish oak ex-sherry, american oak ex-sherry and american oak ex-bourbon. The regular 12 year old was interesting on the nose, with hints of garibaldi biscuits, but was slightly disappointing on first taste with lots of wood tannins and a hint of spiciness. With water the woodiness softened to a pleasant vanilla, but the dram wasn’t particularly inspiring, and certainly not as interesting as I felt the 10 year old was. The Fine Oak continued the biscuity theme with a touch of rich tea and sugary branches on the nose. To taste it was very woody, as the name might suggest, and quite sweet. It had a hint of perfume to the flavour, touching on sandwalwood. My rather flowery tasting note says “Like the floor of a stately home after a party involving cake and messy guests”. Water quickly diluted the flavour, but calmed the woodiness, bringing out more of the perfume and a note of floor polish. Right at the back of the mouth I also got a hint of sherbert lemons. It was more interesting than the regular 12, but not one that’s going on my list. 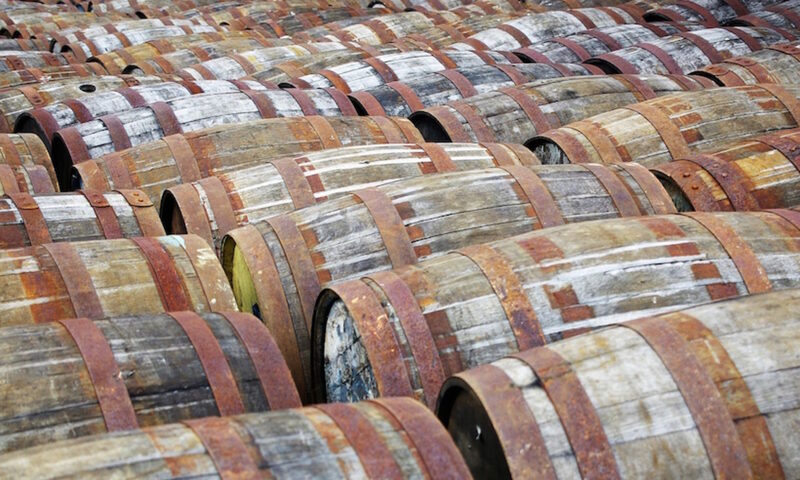 Matured in spanish sherry casks, american oak sherry casks and american bourbon casks. 40% ABV. Not listed on the Macallan website and seems sold out on several UK websites.